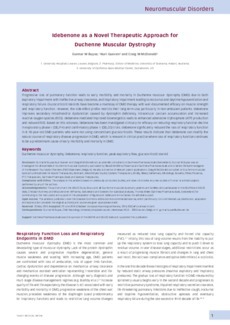 Progressive loss of pulmonary function leads to early morbidity and mortality in Duchenne muscular dystrophy (DMD) due to both expiratory impairment with ineffective airway clearance, and inspiratory impairment leading to nocturnal and daytime hypoventilation and respiratory failure. Glucocorticoid steroids have become a mainstay of DMD therapy with well-documented efficacy on muscle strength and respiratory function. However, the side-effect profile restricts their long-term use, particularly in non-ambulant patients. Idebenone improves secondary mitochondrial dysfunction caused by dystrophin deficiency, intracellular calcium accumulation and increased reactive oxygen species (ROS). Idebenone-mediated improved bioenergetics leads to enhanced adenosine triphosphate (ATP) production and reduced ROS. Based on this rationale, idebenone has been investigated clinically for efficacy on reducing respiratory function decline in exploratory phase II (DELPHI) and confirmatory phase III (DELOS) trials. Idebenone significantly reduced the loss of respiratory function in 8�-year-old DMD patients who were not using concomitant glucocorticoids. These results indicate that idebenone can modify the natural course of respiratory disease progression in DMD, which is relevant in clinical practice where loss of respiratory function continues to be a predominant cause of early morbidity and mortality in DMD.